Diamond Fortress’s fingerprint ID system works on a smartphone and opens secure banking services to remote areas of the world. According to the World Bank, about 1.7 billion people across the globe have no access to a financial institution. In the developing world, opening a bank account can be the first step out of poverty, and for many of these unbanked individuals, the answer is at their fingertips. “One of the big obstacles there is lack of provable identity,” says Chace Hatcher, founder and CEO of Diamond Fortress Technologies. Based in Birmingham’s Innovation Depot, Diamond Fortress has developed authentication and security solutions via fingerprint identification. 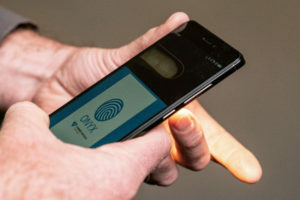 ONYX, the company’s groundbreaking software, allows the clear and accurate touch-free capture of fingerprints through a mobile device’s camera. Diamond Fortress provides clients with an ONYX software development kit that can be integrated into their own applications. The skilled team of nine tech professionals exports its services to more than 200 countries, including Australia, Mexico and Pakistan. After taking a high-contrast photo, the software sends the image to a remote server for authentication. Originally from Florida, Hatcher studied law at Cumberland in Birmingham. There, he started several businesses in various fields, from business consulting to staffing. The serial entrepreneur also served in the U.S. National Guard as a platoon leader and taught himself engineering. Around 2011, while in business consulting, he was introduced to the emerging world of digital identity management. Masses of fingers — some real, some fake, some disguised — were all part of the process of validating ONYX technology. It’s now been used more than 80 million times around the world. Diamond Fortress’ solution was software that could be integrated in an existing device to make use of its own camera, no peripherals required. The absence of hardware also keeps the user cost relatively low. Generally, after a one-time fee for the development kit, customers pay according to each transaction authorized through the software. Other pricing models offer per-device or per-rooftop payment options. While researching the matter, Hatcher encountered a company that was working on touchless optical-based biometrics in Huntsville. He licensed their technology to modify it for use in touchless fingerprint capture. Diamond Fortress was formed in May 2012, and by February 2013 the company was focused on monetizing their ONYX technology. Right out of the gate, the company had to settle a litigation issue to protect its IP. Although the pre-case settlement was favorable, it cost them a substantial amount of their initial investment dollars. While Funchess handles the company’s marketing duties, he also has been instrumental in the software development itself, painstakingly training ONYX’s AI to identify real and fake fingerprints, bare or covered, live or dead. In many developing countries, an individual’s legal identity is linked to biological data such as their fingerprints. Programs like India’s Aadhaar ID system build and maintain vast databases of residents’ information, accessible for authentication with the government. “What makes ONYX so powerful there is that they already have a fingerprint database,” Hatcher says. In 2016, Paysys Labs in Pakistan called on Diamond Fortress to deploy its technology in the nation’s market to help verify IDs for the central bank. The service was entered into a grant program that was affiliated with the Bill and Melinda Gates Foundation. The foundation saw ONYX’s potential and direct contact was eventually established. In 2017, Diamond Fortress received a foundation grant via DFS Labs for DFT Empower, a wholly owned subsidiary that provides financial inclusion services to nations defined as lower and lower-middle income countries by the World Bank. The grant was renewed last year. ONYX can be integrated into the mobile banking app of a user or agent. The user can enter their biographical information and pair that with an image of their fingerprint. The info is sent to their national government, which can verify it, or match it against the print on an individual’s ID card. As their efforts expand across the globe, Hatcher is confident that Diamond Fortress will shine as an attractive acquisition. ONYX has been used for authentication more than 80 million times now, with growth expected as the company enters new markets. The proprietary tech is impressive, and the talent behind it would be an invaluable asset. 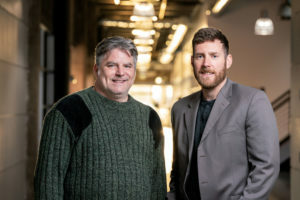 Tom Little and Cary Norton are Birmingham-based freelancers for Business Alabama.